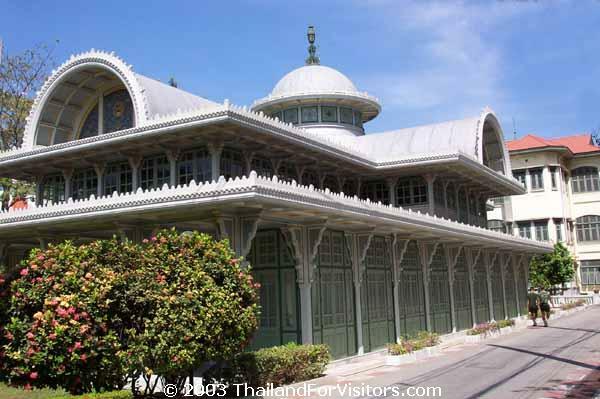 It's hard to believe now, but when it was built in 1909, Phayathai Palace was a 'country' cottage where King Rama V (Chulalongkorn) and Queen Saowabha could escape on the weekends and relax 'down on the farm.' The small palace was indeed a farm where the king and queen conducted agricultural experiments - something the current king still practices at Chitlada Palace as well. The queen apparently enjoyed the palace greatly, and sometimes lingered there for several days, forcing the king to drive his new yellow electric car to visit her. This bucolic idyll didn't last long. King Chulalongkorn died on 23 October 1910, only a few months after the palace's official inauguration. The Thewaratsaparom Throne Hall, used as a theater. The theater is basically one big room with French doors running around the exterior. Although rectangular in plan, the roof is two-tiered with the second tier forming a cruciform of barrel vaults intersecting beneath raised dome. The edge of the roof is lined with finely carved fretwork. The columns supporting the roof and interior balcony sport intricately carved pierced bracket supports. Rama VI was a keen playwright and actor, so the theater was much in use during his reign. Throne hall of the central building. 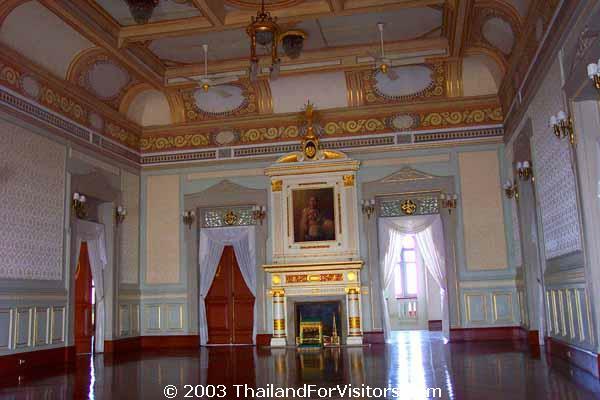 The room to the west of the throne hall was once the queen's bedchamber and is now used for teaching Thai classical music. The round room in the turret was a study. Now it's something of a shrine to the late queen. The 'Roman' garden behind the palace buildings. Behind the palace building was a large garden. In Rama V's time, this was where the experimental farm was located. 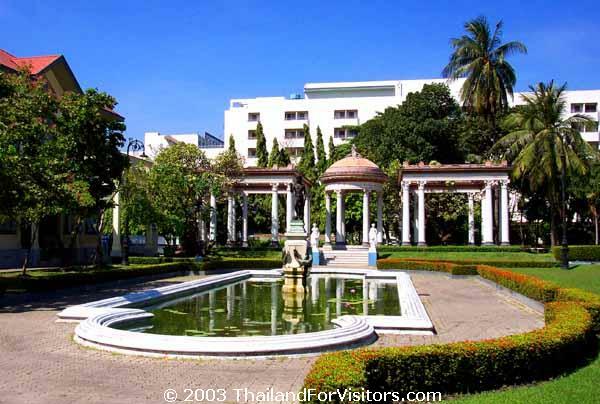 Rama VI built the 'Roman Garden' immediately behind the residence. Further back he had a model city called 'Dusit Thani' built to help train people how a city should be run. Note that as of late 2012 the second floor of the main building was closed for renovation. Phayathai Palace is within the grounds of Phramongkutklao Hospital at 315 Rachawithi Road. It's a short distance from the the Victory Monument, making it easily accessible by Skytrain to the Victory Monument station, then walk east down Rachawithi. The palace is on the north side of the road.